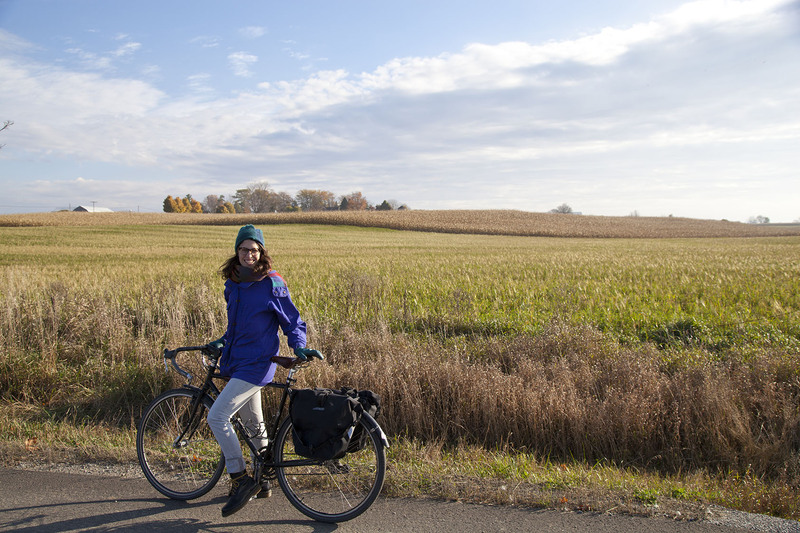 Photo features Emilia Hurd, cycling in Durham. This post was originally published October 7, 2015 from the Tales from the Greenbelt blog, on Greenbelt.ca. The Greenbelt Route is now a reality — I've ridden it from end to end in both directions, and have found hundreds of ideas for how to explore this stunning near-urban landscape from the seat of my bicycle. Ontario’s Greenbelt has so much to offer at this time of year, and the cooler weather in spring and autumn make these shoulder seasons some of the most comfortable times of year to ride a bike. With the bulk of farm crops now coming off the fields, what better time of year for a bicycle farm market tour? To celebrate the Greenbelt cornucopia, I have organized this weekend cycling getaway in the regions of York and Durham. It's a two-day overnight trip that highlights a number of farm fresh hot spots in this productive agricultural region. All the tasty, local stops en route can be found on the new Greenbelt Route interactive website, and this custom "farm by bike" tour is ready just in time for the harvest season! Photo taken south of Brantford (a distance from the Greenbelt Route). Please note that I took care to avoid busier roads, but that I have yet to ride this particular route. 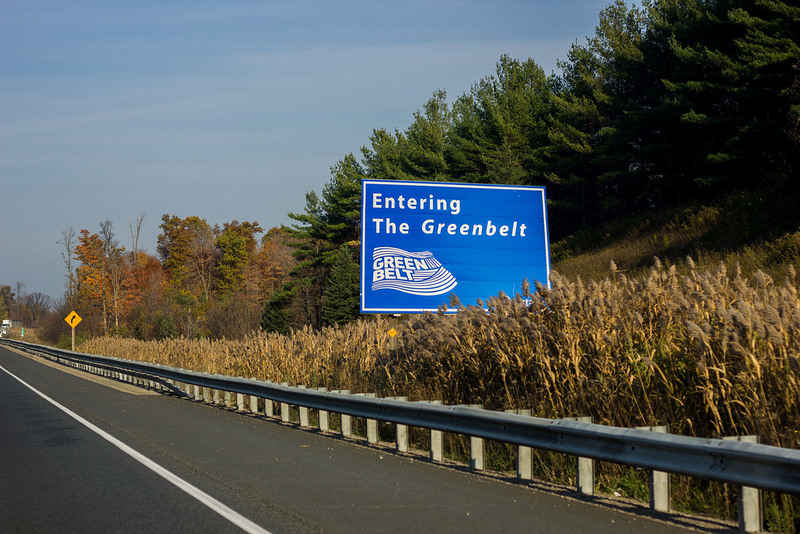 Head north along the Greenbelt Route from Stouffville, following Ninth Line up past Musselman’s Lake to the historic hamlet of Mt Albert. Take your time browsing the local shops, services and a variety of restaurants. From here, head north along Centre St to link up with the hamlets of Zephyr and Udora. It’s worth a stop at the old grist mill in Udora before wrapping up your day in Pefferlaw where you will find a host of dining options and accommodations along the Pefferlaw river, down to the river mouth at Lake Simcoe. Take in the sunset, and consider that you just cycled right over the Oak Ridges Moraine, the "rain barrel of Ontario." Musselman’s Lake — After a big climb out of Stouffville, be sure to take a rest by the water. Pull over here for a big scoop of Kawartha Dairy ice cream before heading on. Mt Albert — Not lost yet? Step off the bike and into Cooper's CSA Farm and Maze (266 Ashworth Road) for a real navigational challenge! It’s also worth visiting Brooks Farms (122 - 141 Ashworth Road) as they are hosting their awesome Fall Fun Festival that has been getting bigger and better every year for the last decade. So many fun activities! Festival cost is $14 per person (children 2 and under get in free). Note there is no entry after 4 p.m. Fall Fun Festival runs on weekends starting September 12 and ending October 31. Zephyr — It's worth the trip to Zephyr Organics (10900 Concession 4), where you can select your own vegetables, fruits and herbs and see the farm for yourself! Get to know your farmers, and consider signing up for a weekly or biweekly food box from their 20-week CSA (Community Supported Agriculture) season. The farm is open from 10 a.m. to 6p.m. on Fridays and Saturdays. Photo taken in Niagara on the Ontario Fruit and Vegetable Growers Association 2008 Summer Tour. Udora — Catch a glimpse of the Peers' Grist Mill (Peers' Lane), one of the last functioning gristmills in Ontario. Harking back to a time when grain was a major agricultural crop in the area, this mill was built in the 1860s, and was recently designated a building of historic and architectural significance under the Ontario Heritage Act. Pefferlaw — There are a number of places to eat in town here, or just take a break at the Pefferlaw dam and Conservation Area. There are several B&Bs located just a short ride north towards the Lake Simcoe shoreline — the sunsets are not to be missed. Be sure to arrange your accommodations ahead of time. Make your way out of Pefferlaw by heading east to Cannington. Access the Beaver River Wetland Trail from Laidlaw St South, and follow the trail south alongside the Beaver River. Here you can savour the smells, sights and sounds of the pristine and largely undeveloped Beaver River wetland. Take your time — you may spot a species of special concern such as the black tern or Western chorus frog. At Blackwater, bear right onto the Trans Canada Trail and continue south. This trail continues right into the town of Uxbridge, a vibrant community with a host of shopping, dining and recreation options. Link back up with the Greenbelt Route just south of Uxbridge, and continue back to Stouffville to wrap up a perfect harvest tour! Cannington — The post office is located on Cameron St, and there are several village restaurants, banks, stores and shops. Pop in to Holy Grounds Café (1 Cameron Street West) for a breakfast featuring local farm products before heading out for the day. Blackwater — Watch for abundant wildlife as you travel along the Beaver River Conservation Area and Recreation Trail. Common sightings include great blue heron, red-winged blackbirds, muskrats and beavers in the wetland. Watch carefully and you may see species of special concern, such as the black tern or the Western chorus frog. 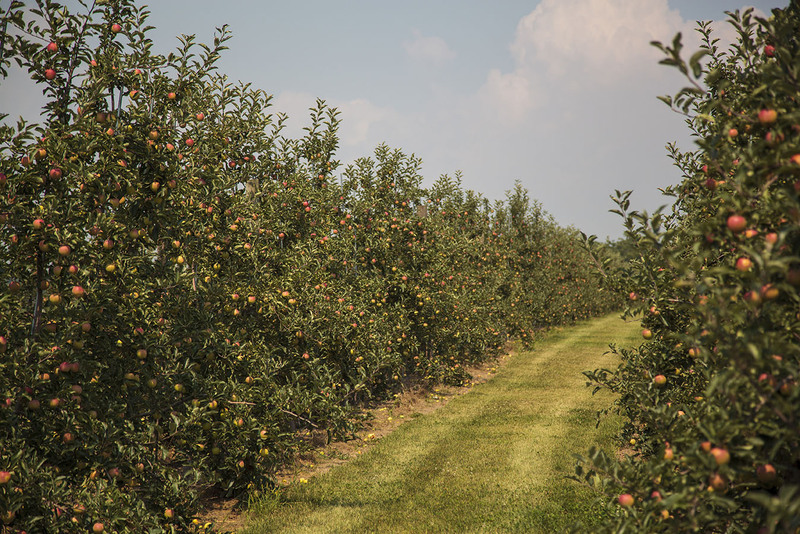 For a farm stop, peel off towards Foggy River Farm (315 Concession 2, Sunderland), a small-scale permaculture farm that produces organic fruits and vegetables. The lead designer and Farm Manager here co-founded Fresh City Farms, an urban farming company based in Toronto. Uxbridge — Enjoy a lunch featuring local ingredients at the Urban Pantry Restaurant (86 Brock Street West) and be sure to check out the Whimsical Lion Country Market (1-24A Toronto Street North) to browse some Greenbelt antiques before heading off for the afternoon. Glen Major Forest — For a change of pace, step off your bike and stretch your legs on this Greenbelt Walk. Did you know that rainwater falling on Glen Major filters through the sand and gravel of the Oak Ridges Moraine, replenishing groundwater reserves and feeding wetlands and streams? Duffins Creek flows from here through the Greenbelt to Lake Ontario, and is one of the healthiest watersheds in the region. While hiking, look out for signs of past uses such as foundations of old farm buildings and the rehabilitated gravel pit. It’s a straight shot back to Stouffville, so enjoy this finale to a perfect two-day ride. You’ve earned it! 125 km, over 2 days (around 60 km on day one, and around 65 km on day two). This is a moderate to advanced road and rail-trail ride. For tips on what to bring for an overnight bicycle tour, check out the What to Bring section at the Greenbelt Route website. Mostly paved, with a rail-trail between Uxbridge and Cannington. The rail-trail features hard-packed gravel suitable for most types of bicycles.